Past performance is not a guarantee of future results. Indices are not available for direct investment. Index performance does not reflect the expenses associated with the management of an actual portfolio. Market segment (index representation) as follows: US Stock Market (Russell 3000 Index), International Developed Stocks (MSCI World ex USA Index [net div. ]), Emerging Markets (MSCI Emerging Markets Index [net div. ]), Global Real Estate (S&P Global REIT Index [net div. ]), US Bond Market (Bloomberg Barclays US Aggregate Bond Index), and Global Bond ex US Market (FTSE WGBI ex USA 1−30 Years [hedged to USD]). S&P data copyright 2018 S&P Dow Jones Indices LLC, a division of S&P Global. All rights reserved. Frank Russell Company is the source and owner of the trademarks, service marks, and copyrights related to the Russell Indexes. MSCI data © MSCI 2018, all rights reserved. Bloomberg Barclays data provided by Bloomberg. FTSE fixed income © 2018 FTSE Fixed Income LLC, all rights reserved. Past performance is not a guarantee of future results. Indices are not available for direct investment. Index performance does not reflect the expenses associated with the management of an actual portfolio. Frank Russell Company is the source and owner of the trademarks, service marks, and copyrights related to the Russell Indexes. MSCI data © MSCI 2018, all rights reserved. Dow Jones data copyright 2018 S&P Dow Jones Indices LLC, a division of S&P Global. All rights reserved. S&P data copyright 2018 S&P Dow Jones Indices LLC, a division of S&P Global. All rights reserved. Bloomberg Barclays data provided by Bloomberg. Treasury bills © Stocks, Bonds, Bills, and Inflation Yearbook™, Ibbotson Associates, Chicago (annually updated work by Roger G. Ibbotson and Rex A. Sinquefield). In US dollar terms, Finland and Italy recorded the highest country performance in developed markets, while Canada and Australia posted the lowest returns for the quarter. In emerging markets, Egypt and Brazil posted the highest country returns, while the Philippines and Poland had the lowest performance. Past performance is not a guarantee of future results. Indices are not available for direct investment. Index performance does not reflect the expenses associated with the management of an actual portfolio. Country performance based on respective indices in the MSCI World ex US IMI Index (for developed markets), MSCI USA IMI Index (for US), and MSCI Emerging Markets IMI Index. All returns in USD and net of withholding tax on dividends. MSCI data © MSCI 2018, all rights reserved. UAE and Qatar have been reclassified as emerging markets by MSCI, effective May 2014. The Bloomberg Commodity Index Total Return declined 0.40% during the first quarter. 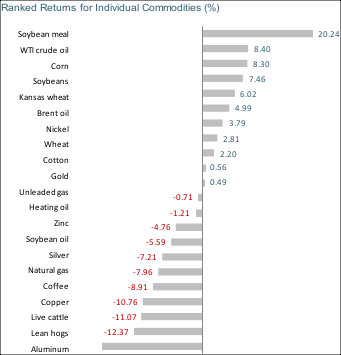 The grains complex led performance, with soybean meal returning 20.24% and corn gaining 8.30%. Energy also advanced, with WTI crude oil returning 8.40% and Brent oil advancing 4.99%. Softs was the worst-performing complex, with sugar and coffee declining by 18.19% and 7.96%, respectively. Past performance is not a guarantee of future results. Index is not available for direct investment. Index performance does not reflect the expenses associated with the management of an actual portfolio. Commodities returns represent the return of the Bloomberg Commodity Total Return Index. Individual Commodities are sub-index values of the Bloomberg Commodity Total Return Index. Data provided by Bloomberg. Interest rates increased in the US during the first quarter. The yield on the 5-year Treasury note rose 36 basis points (bps), ending at 2.56%. The yield on the 10-year Treasury note increased 34 bps to 2.74%. The 30-year Treasury bond yield rose 23 bps to finish at 2.97%. On the short end of the yield curve, the 1-month Treasury bill yield increased 35 bps to 1.63%, while the 1-year Treasury bill yield rose 33 bps to 2.09%. The 2-year Treasury note finished at 2.27% after a yield increase of 38 bps. In terms of total return, short-term corporate bonds dipped 0.38% and intermediate corporates fell 1.50%. Short-term municipal bonds advanced 0.10%, while intermediate munis declined 1.29%. Revenue bonds performed in-line with general obligation bonds, declining 1.19% and 1.20%, respectively. One basis point equals 0.01%. Past performance is not a guarantee of future results. Indices are not available for direct investment. Index performance does not reflect the expenses associated with the management of an actual portfolio. Yield curve data from Federal Reserve. State and local bonds are from the S&P National AMT-Free Municipal Bond Index. AAA-AA Corporates represent the Bank of America Merrill Lynch US Corporates, AA-AAA rated. A-BBB Corporates represent the Bank of America Merrill Lynch US Corporates, BBB-A rated. Bloomberg Barclays data provided by Bloomberg. US long-term bonds, bills, inflation, and fixed income factor data © Stocks, Bonds, Bills, and Inflation (SBBI) Yearbook™, Ibbotson Associates, Chicago (annually updated work by Roger G. Ibbotson and Rex A. Sinquefield). FTSE fixed income indices © 2018 FTSE Fixed Income LLC, all rights reserved. ICE BofAML index data © 2018 ICE Data Indices, LLC. These portfolios illustrate the performance of different global stock/bond mixes. Mixes with larger allocations to stocks are considered riskier but have higher expected returns over time. Diversification does not eliminate the risk of market loss. Past performance is not a guarantee of future results. Indices are not available for direct investment. Index performance does not reflect expenses associated with the management of an actual portfolio. Asset allocations and the hypothetical index portfolio returns are for illustrative purposes only and do not represent actual performance. Global Stocks represented by MSCI All Country World Index (gross div.) and Treasury Bills represented by US One-Month Treasury Bills. Globally diversified allocations rebalanced monthly, no withdrawals. Data © MSCI 2018, all rights reserved. Treasury bills © Stocks, Bonds, Bills, and Inflation Yearbook™, Ibbotson Associates, Chicago (annually updated work by Roger G. Ibbotson and Rex A. Sinquefield).